The Finnish record label Ondine has been awarded a prestigious Gramophone Award in the Contemporary Category with its recording of Rautavaara's Cello Concerto and Percussion Concerto by the Helsinki Philharmonic Orchestra, conducted by John Storgårds. The award ceremony was held on 27 September in London. The virtuoso Percussion Concerto Incantations (2008) features percussion soloist Colin Currie, who is the dedicatee and première performer of this work. Currie himself wrote the virtuoso cadenza to the final movement. 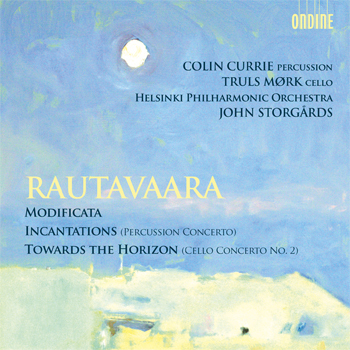 Rautavaara's Second Cello Concerto Towards the Horizon (2009) was written for cellist Truls Mørk. Einojuhani Rautavaara is recognized as one of the most notable Finnish composers after Jean Sibelius. His recordings on Ondine have been garnered numerous awards (including a recent GRAMMY nomination for his opera Kaivos). Under their chief conductor John Storgårds, the Helsinki Philharmonic Orchestra builds on long-time pedigrees of performing their compatriot's music. This is their eleventh recording of Rautavaara's music for Ondine. In the Contemporary Category three recordings were nominated. Besides the Rautavaara recording another Ondine release (ODE 1173-2) with music by Kaija Saariaho and Sakari Oramo conducting the Finnish Radio Symphony Orchestra was competing for the award.